Another stunning game from Eipix Entertainment, creators of the Amaranthine Voyage and Sea of Lies series! A lost masterpiece has just resurfaced in Austria, and Lisa Steiner, the artist in charge of restoring it, won’t talk to anyone in the media… except you. But when you arrive to interview her, Lisa runs away without explanation. Now you must decipher the secret clues hidden in her paintings to track her down and get your story. Lisa’s life – and yours – may depend on it. Dive into a gorgeous, artistic world as you uncover the truth. 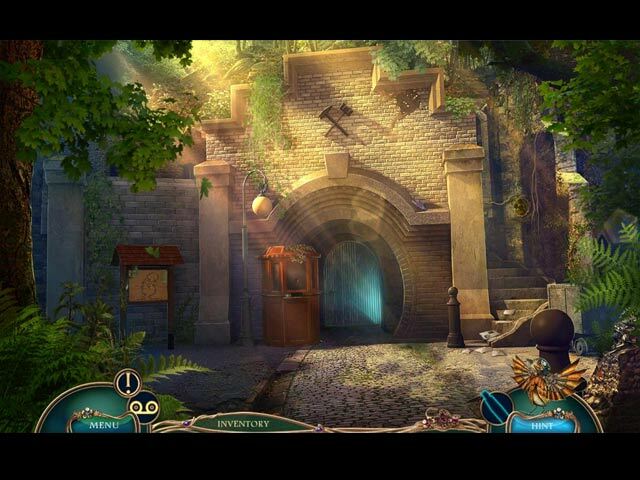 Just be careful – deception is a deadly art in this thrilling Hidden Object Puzzle Adventure game! Uncover another dangerous plot in the bonus game. Collect souvenirs, letters, and achievements! Unlock extras, including videos, wallpapers, and original music. 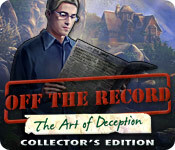 Off The Record: The Art of Deception Collector's Edition is rated 3.8 out of 5 by 39. Rated 5 out of 5 by Kimmycoo from Gorgeous Game I was totally enthralled with all of the beautiful scenes in this great game. I loved everything about the game. The bonus stuff in the CE was very worth it. I enjoyed collecting all of the morphs and paint items as well as the secret letters. Great music and wallpapers as well. The bonus game was very worth it though you only got a couple of new scenes. I highly recommend any of the games in this series! Rated 5 out of 5 by sroebuck117 from Gorgeous! Very EYE appealing.. This game was so much fun. There is so much to do. The HOG's are unique, but not insanely difficult. The game was laid back and with a plot twist! The art was vivid and stunning! Two thumbs way up! Rated 5 out of 5 by tutortime from Enjoyed this game. I really like this game developer. The game was well thought out and gave some great extras. I like finding extra objects in a game. Rated 5 out of 5 by JenSolley from No ghosts!! Just fun!! My review is based on completion of the full game plus the bonus game. I purchased/played the CE. I enjoyed this game a lot!! The graphics were beautiful!! The story line was pretty good, although at the beginning of the game I felt like my character was being really nosy and pushing her self into other people's business. In the game your are a reporter and you get an interview with a artist that is restoring a very rare and valuable painting. The artist is shy and hates interviews, so she kinds runs away from you, but you track her down, just like a bloodhound!! In the end it all works out good!! As far as the game its self, all the usual stuff, assorted games and HOPs. I enjoyed this game because it did NOT have any ghosts or frozen stuff!! The story was different and I liked it very much!! Rated 5 out of 5 by FORTUNATUS from Please KEEP this amazingly great game ON the Record! Adventure lovers, those seeking the unique, immersive, exciting, and just plain FUN, I urge you to at least check out this game via the Demo. This developer is so talented and they managed to create an adrenaline boosting game without the typical and recent 'as-per-usual' additions of supernatural, gloom and doom. This game provides excitement without the headache inducing graphics, sound, vo and music.... all of those features are incredibly well done yet all with the theme of intrigue and mystery. I have not been inspired to purchase many games as of late due to so many clones and look a-likes [whereas prior to this trend I owned almost every game BF offered] so I was SO particularly happy to FINALLY demo a game that I enjoyed from the beginning to end as well as one I'm eager to purchase! So as you can tell already, I am very, very impressed with this Collector's Edition [CE] by Eipix; there is so much creativity and sheer talent that went into this game.... it definitively deserves more than the 5 stars I allowed to give it. Please give it a whirl; [and to think I almost passed this one by]!.... BRAVO developers, thank you and thank you, BF.... PLEASE more like this!?! Rated 5 out of 5 by pennmom36 from The Art Of Deception Leda's Blight, a stunning masterpiece, was thought to have been lost forever; however, it has incredibly resurfaced! Art collectors are chomping at the bit to place a bid on this beautiful painting at the upcoming auction, but first the painting must undergo a serious restoration. Lisa Steiner agrees to return to this quaint little town in Austria, to masterfully restore this original painting, but is it truly the original? Felicity Adams is the only journalist who has been able to interview Lisa, a known recluse. Your journalistic instincts are telling you that Ms. Steiner is being deceptive, or perhaps manipulated...this is clearly the art of deception! Sure is a nice change of pace from the fairy tale, someone kidnapped the princess games, not that they're bad, just an overabundance lately. I will admit that this game starts out too slow and cheesy, but it really does improve. There are lot's of Achievements available to earn, and 17 hidden letters to find which unlock special features. Some of the inventory items have plus signs indicating further action is required before using that item, including some very intriguing puzzles! There are icons next to the inventory bar which keep track of the important features such as the achievements you have earned, your goals or how many collectibles you have acquired. 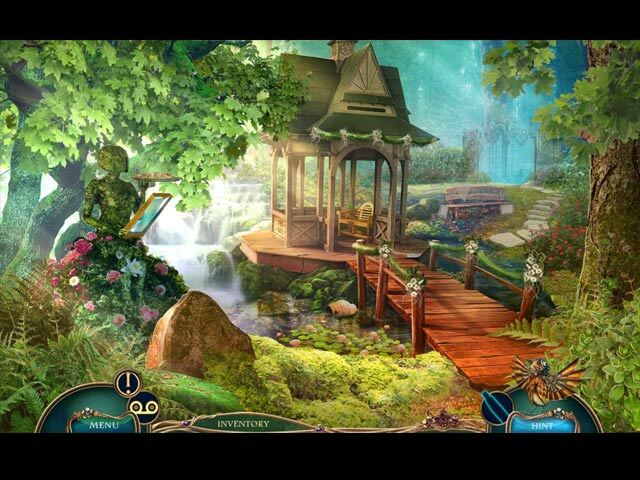 The Hidden Object Scenes are varied, some your typical (and my all time favorite) interactive list finds, and even scenes that scroll one scene to the left or one scene to the right as you are tasked with finding 12 flowers, 6 birds and 3 cats, but I found this HOP too easy and scrolling left and right constantly became a tad bit annoying. The Mini Games were pretty decent, although some were mind bending puzzles where you had to use directional arrows to slide half sections of different sizes to the middle, stacking the sections from the smallest to the largest. This Collectors Edition has Movies, Music, Behind the Scenes, replayable HOP and Mini Games, Pictures, a Souvenir Room, a Painters Den, Achievements, Morphs, a built in Strategy Guide and a Bonus Chapter, enjoy! Rated 5 out of 5 by GordanaG from Another Adventurous Masterpiece of Eipix I finished free trial in just one blink of an eye! Once again, in a role of a reporter I was falling into the artistic adventure of finding a famous painter, who is supposed to do the interview with me. She has denied my previous requests many times but I won't take no for an answer, because this is such an exclusive opportunity for me as a reporter. She was given a task to restore a very famous painting which will be sold on the auction. As the time of this great and very important interview has come, we were interrupted on the very beginning by her boyfriend and that is where the fun begins... I really enjoyed through the entire story! Scenes are beautifully done and so colourful. 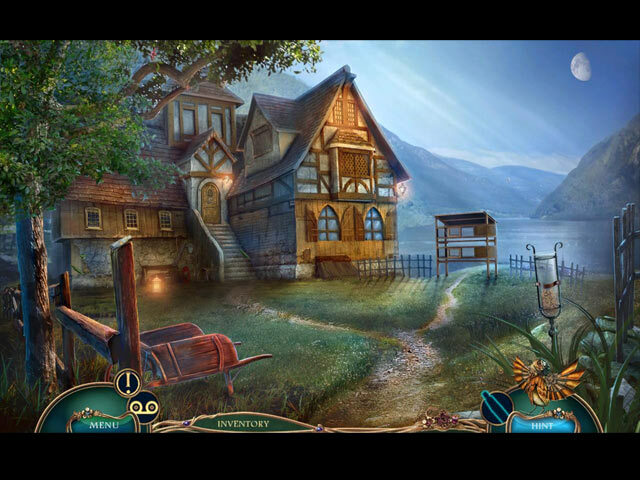 Solving all mini games was more than fun, especially HOPA's, because they are my favourite type of mini games. There were few funny tasks, like that one with black sheep, but I won't be spoiling that for you. All in all, excellent game! If I could give you 10 stars for this, I surely would! Rated 5 out of 5 by Shirleygames from No nightmares tonight I won't rehash the plot as it has been described by other reviewers. Finally we have another game that is free of witches, monsters, all things occult and creepy. Just a good old detective game. Characters are actual people and voice overs appropriate to the locale. Good variety of HOS and puzzles range from fairly easy, to I'll admit, I did hit the skip button. It is not the most challenging game I have played by was a wonderful way to spend a snowy Saturday afternoon. A worthy addition to the "Off the Record" franchise. A famous painter finds herself in over her head!